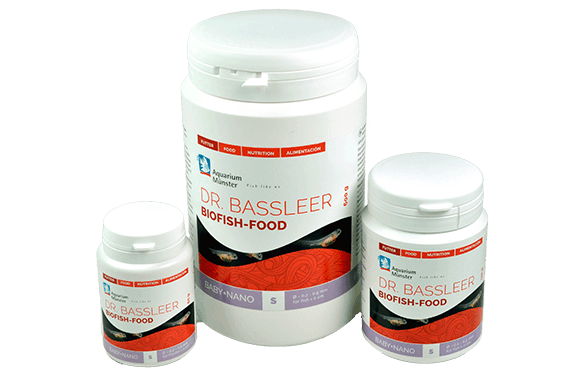 DR. BASSLEER BIOFISH FOOD BABY+NANO is a fine granulated food (approx. 200 µm) for fish larvae, juvenile fish, nano-aquarium fish (e. g. small Rasbora species) and shrimps. It remains stable for a long time and overcomes water pollution. The high proportion of high-quality proteins associated with Chlorella freshwater algae ensure a healthy growth. This micro-algae is 100 % digested and abounds in carotinoids (e.g. lutein, astaxanthin), antioxidants (e.g. beta-carotin), essential unsaturated fatty acids (e.g. omega-3), vitamins and trace elements (iron, selenium, iodine, folic acid, calcium). Chlorophyll as well as valuable nucleic acids foster the regeneration process.